What screams summer better then summer brights?! 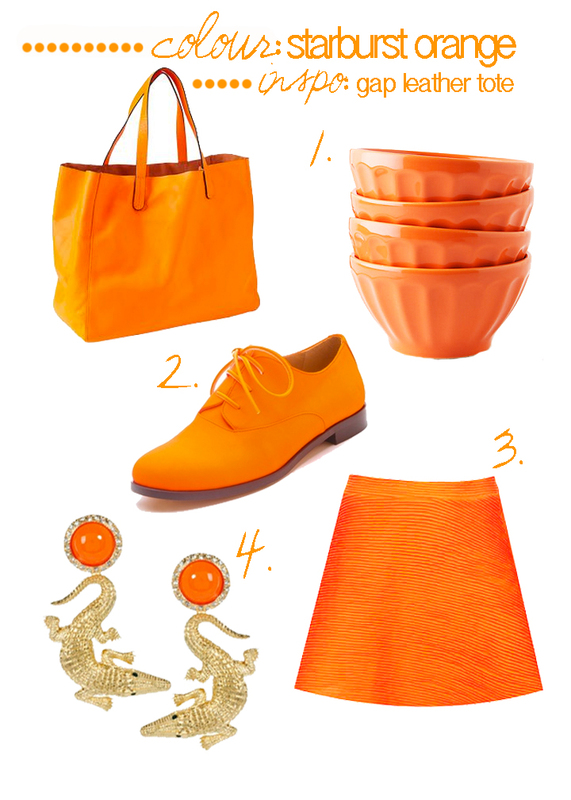 This starburst orange colour is inspired by Gaps perfect leather tote, for every girls need. There are so many ways to add this bright hue into your summer days and nights, wheather you bring it into your kitchen with the latte (or as I use them 'Ice Cream') bowls! The classic oxford can be paired with denim cut offs and a white tee, or a little black dress. These crocodile earrings are an accesoy that can be taken from day to night creating a jungle girl feel. Or play it safe with a skater skirt in the orange hue with a self textured fabric pair it with a basic tank to make the skirt pop!